Qamar Banshim (the Moon of Banu Hashim), is the son of Imam Ali (a) and Umm al-Banin. He was the commander and standard-bearer of the caravan of Imam al-Husayn (a) in the Battle of Ashura'. Abbas is considered by Shi'a among the children of Imams (a) holding the highest positions. Shi'a speak of his merits and mourn for him especially on the Day of Tasu'a (9th of Muharram). 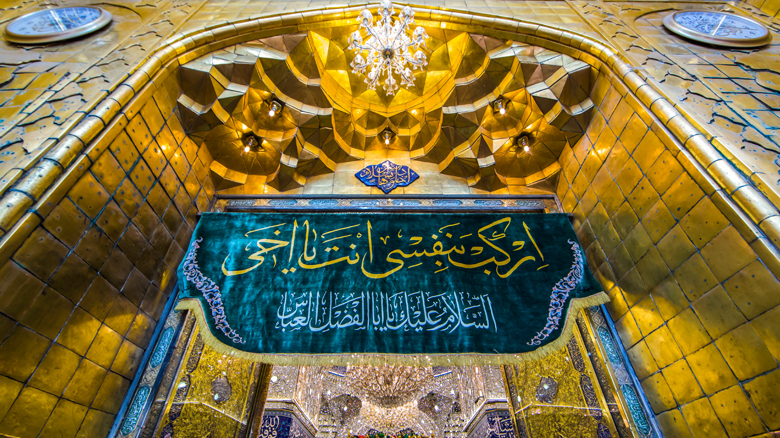 He is considered the exemplar of dignity, bravery, generosity, and obedience of the infallible Imam (a). In Karbala, he was the standard-bearer and water-supplier of the army of his brother, al-Husayn b. 'Ali (a) and thus he is also known among Shi'a as Saqqa [the water-supplier] of the plain of Karbala. According to reports, after the caravan of Imam al-Husayn (a) faced with the problem of the shortage of water, al-'Abbas succeeded to bring water for the family and companions of Imam al-Husayn (a) on the 7th of Muharram . On the day of 'Ashura', once again he (a) attempted to bring water from the Euphrates; but on his return, they shot his leather water pouch, cut his hands and martyred him.